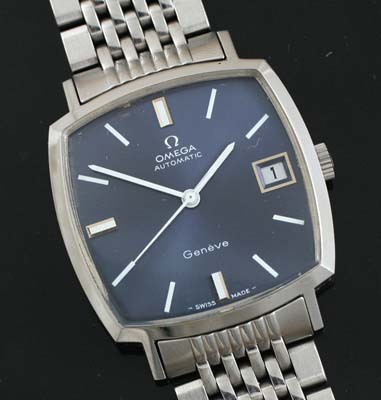 Classic period piece Omega Geneve with square steel case and beautiful blue dial. Automatic calibre 565 movement with quickset date feature. I love the contrast this dark blue dial has with the shining stainless steel case. The whole watch just sparkles on your wrist. 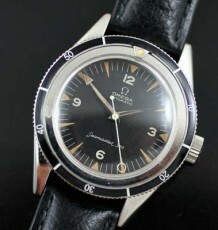 This square Omega cases don’t come up very often, usually you’ll find some variation of a oval or rounded edge case dating to this period of the late 60’s through 1970’s. 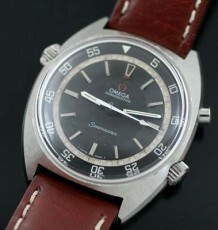 This particular watch dates to 1971 based on the serial number. 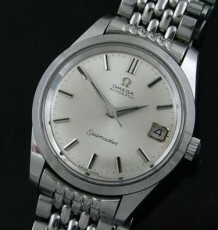 The watch is fitted with the highly regarded and ultra durable Omega automatic calibre 565 movement. This model uses the quick-set date function. 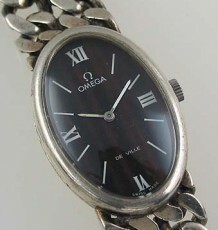 The watch is fitted with original and signed Omega crown and crystal and was just serviced by my watchmaker. This watch measures 32 mm wide excluding crown by 38 mm long. The steel beads of rice bracelet is sized to fit a 7.25 inch wrist.